A reverse blog... Last entry is the most recent. Scroll down and follow the story. I am looking at the schedule (see above) Ron scanned in yesterday and my initial thought on seeing the itinerary the first time, is that the trip will be well organized. The only problem with the schedule was that it did not work, there were too many cars and not enough time was allowed at each stop. 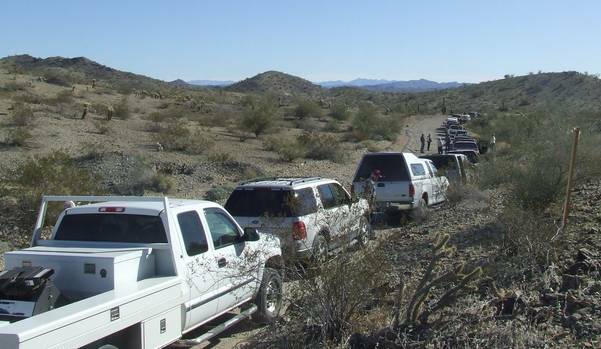 When you get 25-30 cars in a convoy it takes a while to get everyone to the destination, not to even discuss trying to get turned around. There was even a very narrow stretch of road where we had to send a truck ahead to stop any oncoming traffic so we could get thorough. You can get a bit of an idea of the logistics of the trip from the picture above as we approached the CAP Canal. Until this point the road is paved and very good going. 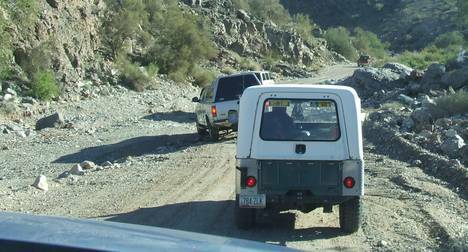 After you cross the canal you are on unimproved roads, driving in the bottom of washes and over a lot of poorly graveled roads, while in the Mineral wash area. The county does do a great job of grading the road, but the recent rains had undone some of their work, and in a couple of weeks the Parker 45o road racers will finish tearing up the roads for a bit, then the county will have to go back in a repair all of the damage. The sign says it all. 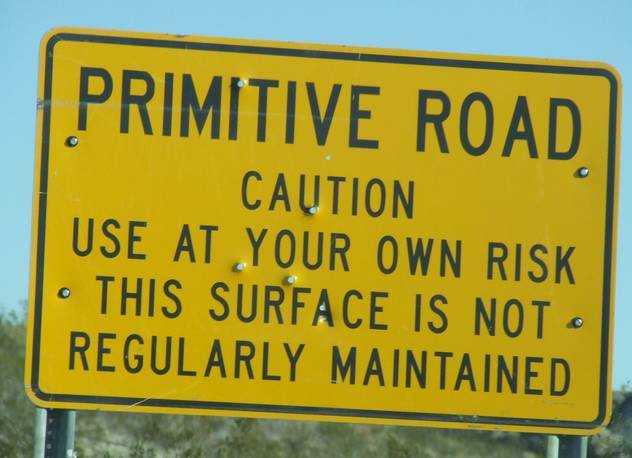 Primitive roads use at your own risk. What they do not tell you is that a slow speed and a lot of common sense will keep you out of trouble, Stay on the main roads, do not go bushwhacking off on your own across the desert, and make sure someone knows where you are going and when you will be back. 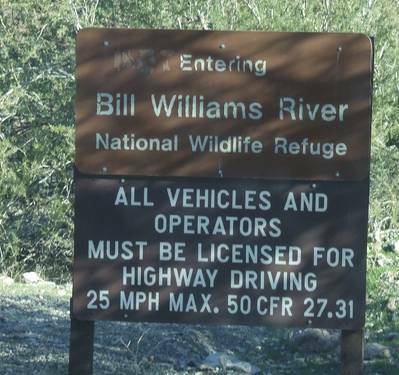 Here are two of the tight spots where the road runs in the bottom of Mineral Wash, along with a sign announcing our arrival at the Bill Williams River. 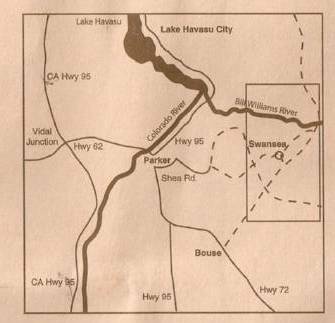 If you are traveling on Hwy 95 you cross the Bill Williams River just a bit North of the lake Havasu Dam. There was a road along the river up to Mineral wash at one time to access the copper mines in the area but it is currently closed by a rock falls, and does not look like it will be reopened. Who would have thought that there is an actual river in the middle of the desert. 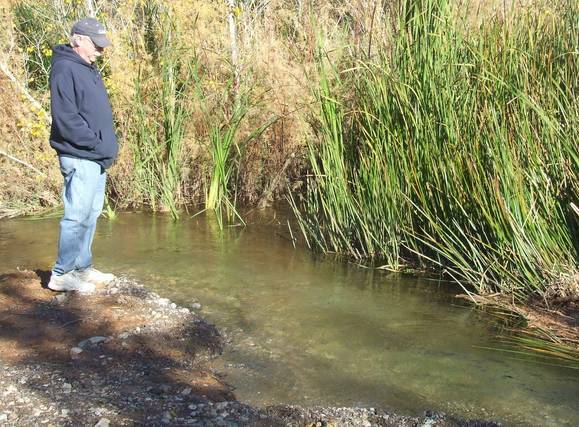 Most of the time when a river is announced along the HW in AZ you end up with a large dry wash, I have been told that there is water just under the surface flowing through the sand and gravel but only rarely have we seen water flowing other then in the Colorado and Salt rivers. 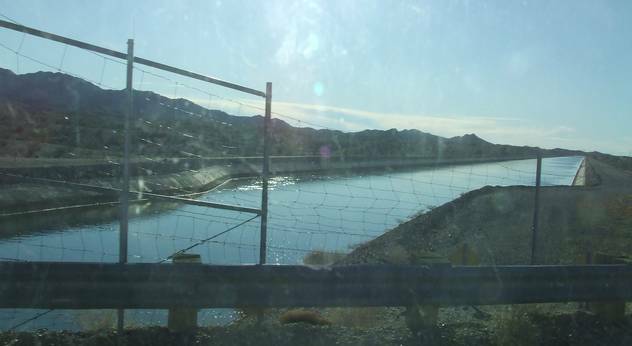 At Yuma there is water from the Gila river, but the river it self is dry, the water is all diverted into the irrigation canals. In the first picture above you get to see me admiring the river, hands in pockets to keep warm. It was a clear day with lots of sun, but the wind out of the North was a little bit on the chilly side. The temperature on Saturday only got to about 50 deg F, and last night dipped below 30 deg. this is supposed to be a winter paradise, not get this cold, need to wait for the cold fronts up north to work their way to the east, then hopefully it will warm back up. 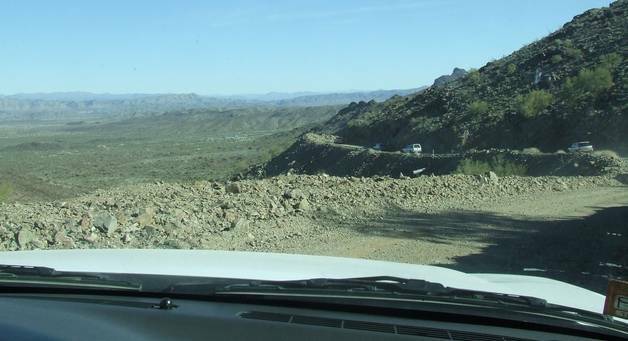 After we left Mineral wash the roads got a lot better, a well graded track through the desert. We had to stop here because the trips leaders decided to stop, I think they wanted a potty break, but could never confirm it. Along the way at various time members would pull off to the side and let everyone pass while they looked for rocks, rock club habits are hard to break. Did not hear of any finds on yesterdays trip, but they may be keeping the locations and what they found a secret, like mushroom hunters. If you ask a mushroom hunter where they found their treasures you are likely to get a very indignant look, or an evasive answer, "found them in the woods", pressed harder you will get outright lies. As you approach Swansea Town site the sign warns of 3 miles of steep grades, We found some steep areas and a very narrow road with lots of switch backs, but nothing that was very bad. That said I would never want to pull the trailer into the area, that washboard roads would shake the cabinets off the walls. We all had a great lunch... all 70 of us at one of the campsites at Swansea Townsite. It was just large enough for us all to park aand get turned around after. Even had a outhouse for the ladies. Now that was planned by Tad Riste and Russell Sias our wagonmasters. I (Ron) did the pictures and then told Terry to fill it in with words. A few more sights around Q. Remember a few days ago when I talked about the BBQ venders. I had said...we spotted this new BBQ place above. I know the health inspector has to grant a license but this place just doesn't look very inviting. He may produce the best BBQ around, but he could at least get a new sign. 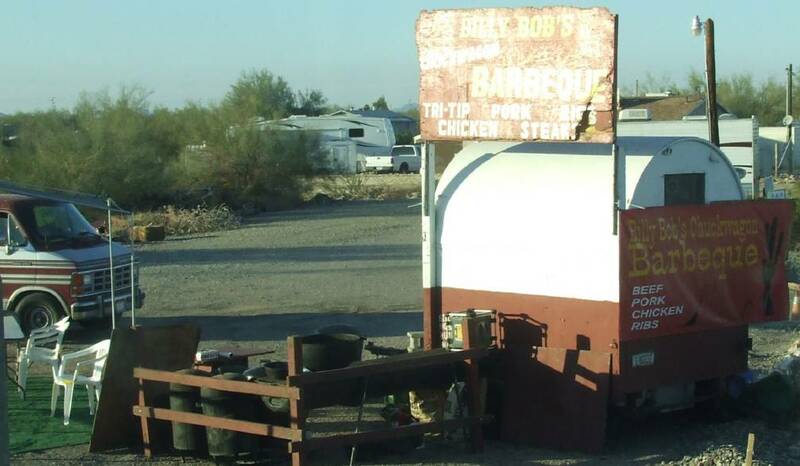 It sez Billy Bob's Chuckwagon Barbeque. Every day as we drive by we noticed the lack of customers. Well on our regular loop the loop drive of Q, (you did do that in high school didn't you?) we spotted this coming toward us on Sunday in the other lane. Billy Bob looks like he has had enough and is heading out of town or at least to a new vender location. He even left his green lawn carpet where he had been set up. It looked pretty stained and worn. We wish him well. But then again we don't see many customers at the mobile food venders yet. Just a wild thought, but methinks a lot of the mobile food vender sales are to the other non food venders around them. Not so much the winter RV visitors. The sticks and bricks restaurants do have vehicles outside so seem to be doing well. Now sure we do see a couple of mobile food sites that are doing well as they have great food and good prices and have built up a customer base from word of mouth. So it can be done, burt it takes time and for the most part this is a tough business in tough times. The BIG crowds come in mid January for the big tent show and if the mobile food venders can make it, by sitting here and only get standing in line sales during that small time frame, more power to them. Might it be they only want, or need to make just a few sales a day, as they are wintering it, cooling their heals, like the rest of us. Now I get it, they made big bucks on their summer fair circuit schedule, and are just giving the deep fat fryer a rest here in Q. Get your campfire going and roast that hot dog as it is supposed to warm up this week here in Q. Upper 60s and low of about only 40. You did know it got down to 28 here this weekend. Good thing propane is at $17.50 for 7 gallons. As long as it is under $20 for a tank fill we are happy. Now if you are still up north, dig a hole in the snow and have your own campfire. You remember when you were a boy or cub scout and you had to light a fire in the winter in the snow with less than three matches and cook a meal. The one you had wrapped up in foil with hamburger, carrot and onion. I remember that, as I was the only one to get my fire to start. Sort of like Survivor for kids. Didn't get me a million, but we all had fun in the snow along with many scout camping trips later in the summers. Me thinks that might be one of the reasons we are now fulltimers. Scouting did take a turn at being bigoted in the last few years, hope they got over that. I remember many United Ways stopped funding them. 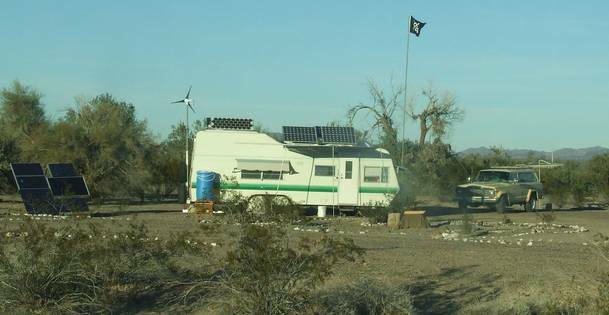 Anyway stay warm and happy..
.When driving around the BLM we spotted this setup. Looks more like a ranch in the outback of Australia. Nice tent buildings with covered roofs. WOW more solar panels than I could count. On top are double rows of them and on the left on the ground a bunch more. Must have lots of controllers and batteries to store that massive amount of power. And off the the left (not in the picture) there were three satellite dishes set up. Yes I said three. Oh, see the wind generator also. We are heading up to Parker today New Years Eve to get stocked up again for this Holiday. Terry has been flipping through his cook books for appetizers, which will be supper and late night fun food. (Pictures after the fact) We will be back before the ball drops you can be sure. New Years Eve and Day seems to be extra festive for us. OK so I have had domicile in SD for several years since 2003. So I go and buy a brand new 5er and send the papers to Ron at MyHomeAddress in Emery to get the title and tags for it. It all came back to me and (Ron at MyHomeAddress) paid a $118 fine for me as a late registration fine on a new 5er I just got the week before. The problem was the Bill Of Sale showed a date of July 24 on it as when it was first made out when I ordered the unit to be built. So now when I took delivery I get the orig. Bill of Sale and they marked it paid in full. I sent it and the Certificate of Origin for the 5er. which showed it was built on 10-16-08 to Ron at My Home Address. I talked to Ron at MyHomeAddress and he tells me to call Hanson county court house. I didn't look at the dates on the BOS and he (Ron) filled out the SD application lic. with the orig. BOS date. In phone calls on what to do I told him it was a brand new 5er and when he recieved my paper work he put the July order date on the application. The Certificate of Origin had a proper completion build date. I called Hanson County and they say they will sent it on up the line to the state for them to refund the fine. So now a couple of months later I call back and the county office does take the time and checks with the state (calls them) and calls me back with the news the state office sez they only go by the BOS and not the Certificate of Origin. I am given the person at the state level and number to talk to for later contact. Am told they will work with me if I get the dealer to send me a new BOS and a notarized statement why the orig. BOS date was wrong. Now I can understand that, as the state of SD just passed a no refunds law. Why this whole post... if any of you are in a position to trade up or down and need to lic and title a RV make sure your dealer puts the correct date you took possesion on the bill of sale and NOT the date you ordered it from them. OK, life is great sea voyage, and this is a little thing, as big things go, but even a liitle drip of content in the wind, can help others. After all we are in the desert where every drop counts. Now if you have a bottle or two of cheap champagne don't worry about staying dry, when you uncork it. Just drink it and have a Happy New Year to you and yours. We are going to watch the Rose Parade live in HD, on our new TV. No not live in person, as in being there, as we are not going to head on over and camp out on the parade route. Terry asked if I would like to do that, since a bus tour from here would be not that high a cost. Might do that in the future. But this year if we are hung over and don't get up early enough, might have view the HD DVR of it if we get carried away with the cheap champagne. I will set the HD DVR to record it to be sure. HGTV I bet has again the best coverage. A New Year and a new start for us and this country. January has the big shows here in Q and at the same time this country will put in office new leadership. January 2009, we're glad to be alive at this time in our history, to see the local Q and national events unfold. We wish all, good times in this new year, but are worried it just might be the worst of times that we, of our age group has ever seen. We think we are well positioned personally to weather the down turn, we shall see won't we. But one thing is sure, all Americans hope the new administration is successful in getting us back on track.